"Rising Stars Game" redirects here. For the video game publisher, see Rising Star Games. The Rising Stars Challenge is a basketball exhibition game held by the National Basketball Association (NBA) on the Friday before the annual All-Star Game as part of the All-Star Weekend. The players are first- and second-year players selected by the NBA's assistant coaches. Two people designated as "general managers" draft players for the two opposing teams. 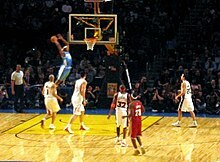 Carmelo Anthony receiving an alley-oop during the 2004 Rookie Challenge game. The Rookie Challenge, established in 1994, was originally competed by two randomly selected teams composed entirely of first-year players. This format was continued until 1996, when it was changed to pit rookie teams of both the Eastern and the Western Conference against each other. In 1999, the game was cancelled as a result of the NBA lockout. Since the 1998 rookie class did not compete that year, the game was revamped and featured a team of standout first-year players ('Rookies') against a team of standout second-year players ('Sophomores'). For 2012 and 2013, the format was changed to having two teams drafted by Basketball Hall of Famers Charles Barkley (Team Chuck) and Shaquille O'Neal (Team Shaq). In 2014, the two teams were drafted by Chris Webber (Team Webber) and Grant Hill (Team Hill). The format of the game and name was changed to the Rising Stars Challenge in 2012. The game format changed in 2015 to Team USA vs Team World, where each team should choose at least three Rookies and three Sophomores, and the squad of each team should have four back courts, four front courts and two swingmen. Unlike regular NBA games, the game was divided into two twenty-minute halves plus multiple five-minute overtime periods, similar to college basketball. The participating players were chosen by voting among the league's assistant coaches. In the game, players wear their respective regular team uniforms, except for 2009, in which players wore fan-designed jerseys. The head coaches of the two teams are the lead assistant coaches of the NBA All-Star Game coach. Starting in 2009, two active NBA players were added to the game coaching staffs. The game is currently sponsored by Mtn Dew Kickstart. Before 2012, the event was known as the Rookie Challenge, officially named the T-Mobile Rookie Challenge and Youth Jam. ^INJ Lonzo Ball is unable to participate due to a left ankle injury. ^REP Kevin Knox was selected as Lonzo Ball's replacement. ^INJ1 Malcolm Brogdon is unable to participate due to a leg injury. ^REP1 Taurean Prince was selected as Malcolm Brogdon's replacement. ^INJ2 Lonzo Ball is unable to participate due to a knee injury. ^REP2 De'Aaron Fox was selected as Lonzo Ball's replacement. ^INJ1 Embiid was unable to participate due to a knee injury. ^REP1 Abrines was named as Embiid's replacement. ^INJ2 Mudiay was unable to participate due to a back injury. ^REP2 Hernangómez was named as Mudiay's replacement. To celebrate the first time the NBA holds the All-Star game outside of the USA, the game makes the World Team the home team instead of Team USA. ^INJ1 Nerlens Noel was unable to participate due to injury. ^REP1 Devin Booker was named as Noel's replacement. ^INJ2 Nikola Mirotić was unable to participate due to injury. ^REP2 Trey Lyles was named as Mirotić's replacement. Team USA won 157–154 in the highest scoring game in Rising Stars Challenge history. Zach LaVine was named MVP, leading all of the USA team with 30 points while also recording 7 rebounds and 4 assists. Jordan Clarkson, D'Angelo Russell, and Devin Booker all scored over 20 points, with Russell also recording 7 assists. Kristaps Porziņģis and Emmanuel Mudiay led the way for Team World with 30 points each, with Andrew Wiggins also scoring 29 points. ^INJ1 Adams was unable to participate due to injury. ^REP1 Nurkić was named as Adams' replacement. ^INJ2 Carter-Williams was unable to participate due to injuries. ^REP2 Covington was named as Carter-Williams' replacement. ^INJ3 Olynyk was unable to participate due to injury. ^REP3 Dellavedova was named as Olynyk's replacement. ^OUT Nurkić decided to not participate for personal reasons. ^REP4 Papanikolaou was named as Nurkić's replacement. The World team won against the U.S. 121-112 at the Rising Stars Challenge at All-Star weekend. Canada's Andrew Wiggins scored 22 points, and Rudy Gobert added 18 points, 12 rebounds and three blocks. Brooklyn's Bojan Bogdanovic of Croatia, and Chicago's Nikola Mirotić of Montenegro added 16 points each for the World team. Victor Oladipo of the Orlando Magic and Zach LaVine of the Minnesota Timberwolves led the U.S. team with 22 points each. Andrew Wiggins, the 2014 NBA draft 1st overall pick, won the game's MVP award. ^INJ Pero Antić was unable to participate due to injury. ^REP Miles Plumlee was named Pero Antić's replacement. ^INJ Andre Drummond was unable to participate due to injury. ^REP Andrew Nicholson was named Andre Drummond's replacement. Shortly before the draft for the rosters, Norris Cole and Jeremy Lin were added to the original player pool. A few days before the game, Tiago Splitter was injured and was replaced by Derrick Favors. Lin played only nine minutes in the game, at his request, due to exhaustion from his rise to stardom that month. ^INJ Tiago Splitter was unable to participate due to injury. ^DNP Kawhi Leonard did not play due to a strained right calf. ^REP Derrick Favors was named Tiago Splitter's replacement. ^INJ Tyreke Evans was unable to participate due to injury. ^REP James Harden was named Tyreke Evans' replacement. ^DNP Derrick Rose was excused from the Rookie Challenge in consideration of being named to the All-Star Game and his participation in the Skills Challenge. ^REP Anthony Morrow was named as a replacement for Derrick Rose. ^INJ Greg Oden was unable to participate due to injury. The 2007 Rookie Challenge took place on Friday, February 16 at the Thomas & Mack Center in Las Vegas. The 2006 Rookie Challenge took place February 17 at the Toyota Center in Houston. The 2005 Rookie Challenge took place February 18 at the Pepsi Center in Denver. The 2004 Rookie Challenge took place February 13 at the Staples Center in Los Angeles. Said to be the most exciting Rookie Challenge in history due to all the highlight-reel dunks. Much of the hype centered on rookie phenoms LeBron James and Carmelo Anthony, who had 33 and 17 points respectively. Amar'e Stoudemire set a Rookie Challenge record with 36 points (it has since been broken). The 2003 Rookie Challenge took place February 8 at the Philips Arena in Atlanta. This was the last time the game was played on a Saturday. The 2002 Rookie Challenge took place February 9 at the First Union Center in Philadelphia. The 2001 Rookie Challenge took place February 10 at the Verizon Center in Washington, D.C.. The 2000 Rookie Challenge took place February 11 at the Oakland Arena in Oakland. The 1998 Rookie Challenge took place February 8 at the Madison Square Garden in New York. The 1997 Rookie Challenge took place February 8 at the Gund Arena in Cleveland. The 1996 Rookie Challenge took place February 10 at the Alamodome in San Antonio. The 1995 Rookie Challenge took place February 11 at the America West Arena in Phoenix. (L) Player to win the award while on the losing team. ^ "Barkley, Shaq to draft teams for BBVA Rising Stars Challenge" (Press release). National Basketball Association. February 7, 2012. Archived from the original on February 8, 2012. ^ a b "Doncic, Simmons headline Mtn Dew Ice Rising Stars rosters". NBA.com. Retrieved January 30, 2019. ^ "LeBron James says Lakers have to 'hold the fort' until Lonzo Ball returns". lonzowire.usatoday.com. Retrieved February 2, 2019. ^ "Kevin Knox replaces Lonzo Ball for Mtn Dew Ice Rising Stars". NBA.com. Retrieved February 6, 2019. ^ a b "Philadelphia 76ers' Ben Simmons, Los Angeles Lakers' Lonzo Ball highlight 2018 Mtn Dew Kickstart Rising Stars rosters". NBA.com. Retrieved January 24, 2018. ^ "Medical Update on Malcolm Brogdon". NBA.com. Retrieved February 14, 2018. ^ "Prince Named To 2018 Mtn Dew Kickstart Rising Stars". NBA.com. Retrieved February 14, 2018. ^ "Ball Out Through All-Star Break". NBA.com. Retrieved February 14, 2018. ^ "De'Aaron Fox to Participate in 2018 Rising Stars". NBA.com. Retrieved February 14, 2018. ^ a b "Minnesota's Towns and Philadelphia's Embiid headline roster for 2017 BBVA Compass Rising Stars Challenge". NBA.com. January 25, 2017. Retrieved January 25, 2017. ^ a b "Denver's Jokic and Oklahoma City's Abrines to replace Philadelphia's Embiid in 2017 NBA All-Star Events". NBA.com. February 15, 2017. Retrieved February 15, 2017. ^ a b "Willy Hernangomez named to 2017 NBA Rising Stars Challenge roster". Bleacher Report. February 15, 2017. Retrieved February 15, 2017. ^ a b "Timberwolves' Wiggins and Towns, Knicks' Porzingis headline rosters for BBVA Compass Rising Stars Challenge". NBA.com. January 27, 2016. Retrieved January 27, 2016. ^ a b "Suns' Booker replaces Noel in BBVA Rising Stars Challenge". NBA.com. February 11, 2016. Retrieved February 11, 2016. ^ a b "BBVA Rising Stars Challenge". NBA.com. February 3, 2016. ^ "NBA Rising Stars Stats and History". February 14, 2016. basketball-reference.com. Retrieved February 14, 2016. ^ a b "Wiggins, Carter-Williams headline rosters for BBVA Compass Rising Stars Challenge". NBA.com. January 28, 2015. Retrieved February 6, 2015. ^ a b c d "Nurkic to replace Adams in BBVA Compass Rising Stars Challenge". NBA.com. February 9, 2015. ^ "World wins BBVA Compass Rising Stars Challenge, Canada's Andrew Wiggins, chosen No. 1 in 2014 Draft, takes MVP honors after dropping 22 points in 121-112 victory over USA". NBA.com. February 13, 2015. Retrieved February 14, 2015. ^ a b BBVA Rising Stars Draft. NBA.com. Retrieved November 23, 2012. ^ Morre, Matt (February 16, 2012). "NBA holds Rising Stars draft for rookies, sophs". CBSSports.com. Archived from the original on February 17, 2012. ^ Beck, Howard (February 24, 2012). "Lin, a Rising Star, Needs a Break". The New York Times. Archived from the original on February 28, 2012. ^ a b "Favors replaces injured Splitter in Rising Stars Challenge". NBA.com. Turner Sports Interactive, Inc. February 21, 2012. Retrieved February 21, 2012. ^ "Spurs forward Leonard out for Rising Stars game". NBA.com. Turner Sports Interactive, Inc. February 24, 2012. Retrieved February 24, 2012. ^ a b "Thunder's Harden replaces Kings' Evans in Rookie Challenge". NBA.com. Turner Sports Interactive, Inc. February 17, 2011. Retrieved February 17, 2011. ^ a b "Warriors' Morrow replaces Bulls' Rose for Rookie Challenge". NBA.com. Turner Sports Interactive, Inc. February 2, 2010. Retrieved February 2, 2010. ^ "Sore knee knocks Blazers' Oden out of Rookie Challenge". NBA.com. Turner Sports Interactive, Inc. February 13, 2009. Retrieved June 22, 2009.